ZF is weak where TRW is strong, CEO Stefan Sommer says. DETROIT (Bloomberg) -- ZF Friedrichshafen, which agreed to buy TRW Automotive Holdings for $13.5 billion including debt on Sept. 15, sees a need for more acquisitions as even the largest auto suppliers seek size and technology. While saying another deal the size of TRW is unlikely, Stefan Sommer, ZF’s CEO, said ZF would also consider acquisitions for its industrial and trucking businesses. Automakers are moving to global platforms and are seeking suppliers with the technology and the ability to provide it wherever it’s needed, Sommer and TRW CEO John Plant told reporters at ZF’s North American headquarters in Northville, Michigan. Prospects for active safety features, driverless cars and vehicles that respond to wireless road data are adding to pressure on suppliers to develop advanced components. "The amount of engineering to do devices of this sophistication, it’s a big burden," Plant said of technology needed for autonomous and connected cars. "It’s a select few that not only have been able to afford to do it, but will be able to afford it in the future. It’s not your middle-sized company that’s going to be able to step up to the plate." ZF agreed to acquire TRW to create a company with the size to push back against pricing demands from the largest automakers. The deal puts ZF in position to overtake of Japan’s Denso and Germany’s Continental to become the world’s second-largest maker of auto parts, trailing only Robert Bosch. ZF was weak where TRW was strong, in active safety systems, that help drivers avoid accidents, Sommer said. Combined, the two companies have the scale, products and technology to feed growing demand for safety components as well as fuel-efficient and lower-emission vehicles, he said. The acquisition will combine ZF’s transmissions with TRW’s electronics, allowing the company to offer automakers larger packages of components. ZF, based in Friedrichshafen, Germany, gains access to TRW’s technology -- from air bags to collision sensors -- that keeps drivers secure and helps avoid crashes. Consumer demand and government regulations are spreading the adoption of such features. 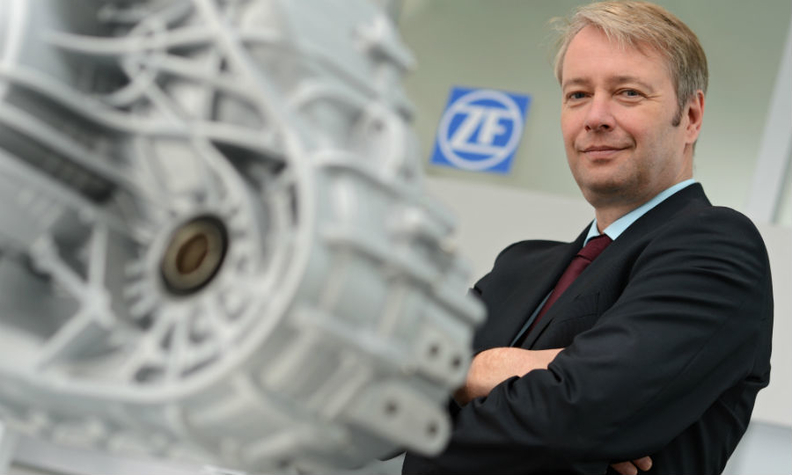 ZF will pay $105.60 a share in a deal approved by both companies' boards. The offer is 16 percent higher than TRW’s closing price in New York on July 9, the day before media reports emerged about ZF’s interest in the takeover. TRW, based in Livonia, Michigan, has 111.2 million shares outstanding, according to its website. TRW shares dropped 0.1 percent to $102.84 at the close in New York Wednesday. ZF is closely held. The two companies have total parts sales of about $41 billion, giving the combination more weight to negotiate contracts with automakers such as Fiat Chrysler or General Motors Co.
ZF makes clutches, axles and transmissions, including the fuel-efficient nine-speeds Fiat uses in its Jeep Cherokee SUVs and Chrysler 200 sedans. Its primary shareholder is the Zeppelin Foundation, started by airship pioneer Ferdinand von Zeppelin in 1908.